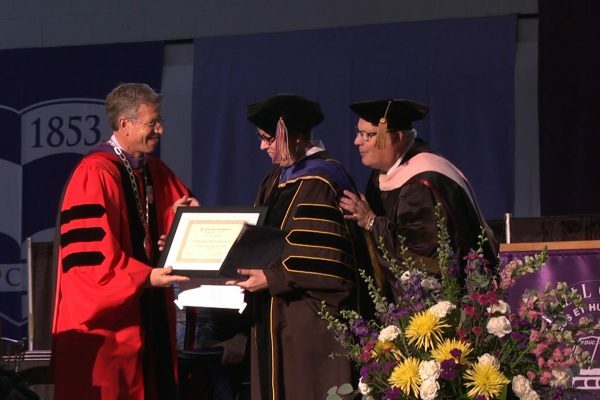 Professor Christina Penn-Goetsch receiving the United Methodist Higher Ed Award for teaching excellence. Cornell students, faculty, and staff represent diversely religious, spiritual-but-not-religious, and secular perspectives. As an historically United Methodist affiliated college, Cornell values this diversity as part of the educational experience and strives to build authentic caring community, mutual appreciation, and respect as we live together amid our religious, cultural, political and other differences. This is one of the many ways we prepare lives for global citizenship, servant leadership, and reconciling virtue in an interdependent, diverse world. 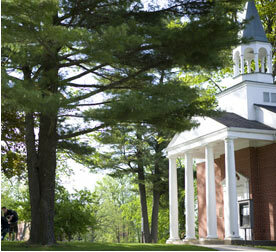 The chaplain provides pastoral care, spiritual guidance and healing, and compassionate listening to students, faculty, and staff of all backgrounds--including the non-religious. This care is offered amid life's unfolding, joys, questioning, and storms; amid fear and wonder; amid the search for purpose, courage, love, healing, connectedness to others and the world, and signs that this universe and our lives (no matter how messy or confusing) are crammed full of meaning and significant worth. If you grew up in a faith tradition, that tradition may help you in connecting with community, meaning, and the Holy. Maybe you didn't grow up in a faith tradition. Maybe you did, but need to explore spiritual homes other than your own, or perhaps heal from painful experiences or ideas you encountered there. Wherever you are on your spiritual journey, I invite you to explore, heal, or deepen it during your college years. I also encourage you to engage in ethical reflection, open yourself to wonder, and join me and student Spiritual Life members of Better Together Inter-faith Allies as well as Soul Friends (ecumenically diverse Christians) as we work to make inter-faith appreciation and cooperation a social norm. Whether in the classroom, at one of the Chaplain & Spiritual Life Office programs such as Being Peace (1st Monday of each Block), or beyond, I encourage you to use the college years as a time to risk discussing religious, political, cultural and other differences with humility, curiosity, and compassion. While discussing deeply held convictions comes with risk of offending or being offended, through humility and sensitive listening we can learn to appreciate one another and to live with our most significant differences. Practicing it now will prepare you for leadership as a healer and bridge builder which our often politically polarized nation, institutions (both religious and secular), and world desperately need for healing and strength. Together we can help move this nation beyond demonizing "the other" and what often feels like a loss of civility, graciousness, mercy, and the golden rule of loving one's neighbor as oneself (an ethic of humility and love found in practically to all the religious of the world and also among secular folk). Together we can can cultivate an awareness of our oneness, even amid our differences (the stuff of "We the People...').